We are offering wide range of Jeans Damage Machine. Garment Packing Machine ideal for coats, shirts, saree all kind of packing, useful for Dry Cleaning Shop, Boutiques, Garments manufacturers etc. cost effective, space saver. This machine is available for cutting materials like cotton, woolen hemp, silk, chemical fibre, sponge leather etc. This machine is a round knife cutting machine. It has 100/110 mm cutting blade & can cut up to 1inch layer of fabric It is equipped with automatic knife grinding device. 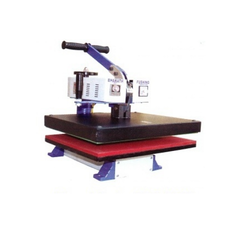 It has features of stable run, convenient operations and powerful cutting ability. We keep a record of the shipping arrangements we offer so as to increases our efficiency and gains the trust of the customers. The offered lot is precisely manufactured using superior grade material and in conformity with the industry standards. Our company is generally known for providing a vast range of hydro extractor heavy duty. These products are available at different designs and colors in the market as per the requirement of our customers. They are very comfortable in their use. The hydro extractors are very simple to handle and can be installed on any floor. We offer Garment Cutting Machines, which is precision engineered to provide smooth and finished edges to the products. Available in accurate dimensions, these machines are in compliance with national and international quality standards. These machines are used for cutting hydraulic hoses and various allied components. - Makes flat visors round by heating and pressing. Positioning flat visor on the heated machine mold and pressing.